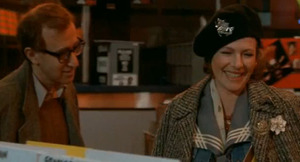 When people talk of iconic Woody Allen characters, the first one that comes to mind is of course Diane Keaton as the menswear-loving Annie Hall. 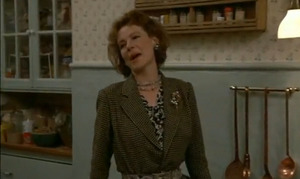 But digging into 1986's Hannah and Her Sisters, one finds another quirky fashion icon in Diane Wiest's character, Holly. 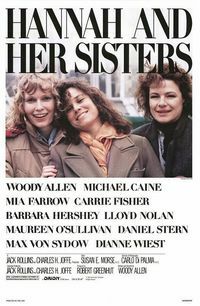 This film is probably one of my top picks in the Woody Allen oeuvre, and I find it utterly charming every time I watch it - and the ending is just the sweetest thing ever. But over the years I've found that the thing I love most is the character of Holly. 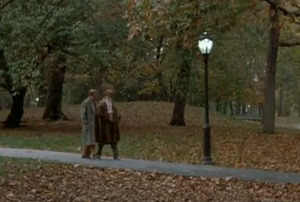 Like the other much-adored New York Holly (Golightly), she's a kooky mixed-up mess and has a fashion sense to match. Even still, there are certain elements that are pure perfection simply because the character owns the look so completely. Like Annie, her style also incorporates menswear, but with some unexpected feminine elements that make the look much softer. Her look is sweet and airy, high and low, full of vintage, objet trouvé pieces that probably came from a boyfriend's closet or a local flea market. 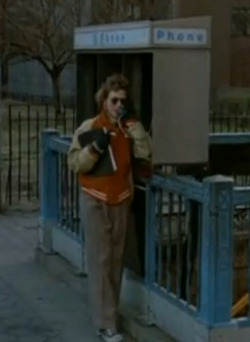 Even at her worst, Holly's sartorial mix shows the true New York bohemian that lies within. When we first meet Holly at the beginning of the film, it's a family Thanksgiving at her sister Hannah's house. Although the sisters are close, it's clear that Holly is harboring a few issues deep down. Her black and white floral print dress is topped by a classic mens houndstooth blazer, cinched at the waist with a belt. A scattering of vintage brooches on the lapel softens the look, but this structured style manifests the nervous discomfort she has in the scene. Holly is a bit of a mess, and we're shown that her frenetic self-destruction has been going on for a while. When we see Holly & Mickey's first date in a flashback, she's smoking incessantly with one hand, and snorting coke with the other. Her crisp white blazer is totally out of place at the punk show she chooses to take them too, and she is equally out of place later on during Bobby Short's show at The Carlysle. 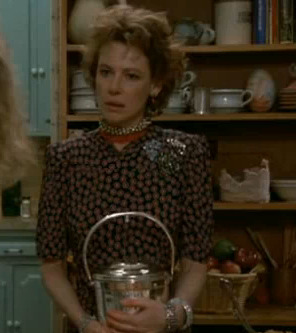 She's over-accessorized herself - a scarf here, big necklaces there, and wrists full of big bracelets - it's all too much. While Holly claims she's hip, chastising Mickey for not being fun, she's the one that's completely insecure. While Holly makes continued attempts in the acting world, she and her friend April (played by Carrie Fisher) open the Stanislavski Catering Company to earn some money on the side. It's interesting to note that Holly asks her sister Hannah (already a successful actress) to help her to pick an outfit for her audition. 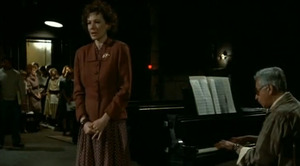 Hannah (played by Mia Farrow) is a classic through and through, so it's no surprise that she would lead Holly toward this buttoned-up ensemble that resembles a suit from the 1940s. It's also no surprise that Holly bombs the audition. The vintage style does seem to suit Holly, but she's still uncomfortable in her own skin and seems small on the stage. Immediately after her audition, April comes in and knocks her song out of the ballpark, effectively making Holly a footnote in the open call. As they walk down the street, the two friends have an argument about a man they've both been dating, and the friendship (as well as the Stanislavski Catering Company) soon comes to an end. I love this look because while April looks like the standard 1980s New Yorker, Holly shows her vintage ecclecticism to full effect. A man's topcoat is paired with a vintage cloche, bright scarves, brooches, a huge basket tote (de rigeur in the 1980s), and finally a charming pair of Fair Isle mittens. At the next Thanksgiving, Holly has given up on acting and is trying her hand at writing. While this makes for some conflict with Hannah, you can see that she's beginning to pull herself together. Her spunky personality is beginning to come through and she seems much more relaxed and self-assured. Her kicky ensemble of trousers, baseball jacket, and dark green Jack Purcell sneakers is so fantastic that I'd wear it even today. When we see her arguing with Hannah in the next scene, she's beginning to mix her punk sensibility with her soft, vintage side. The 1940s-cut dress is perfectly embellished by another scattering of brooches (possibly the same group from the first Thanksgiving?) and a pair of punk chokers. In this scene it's clear that Holly is coming together while Hannah is coming apart. 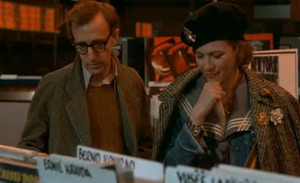 My favorite Holly outfit (and one of my favorite film ensembles ever,) comes when Mickey and Holly reunite in a record store. Holly has clearly come into her own and is freely mixing her favorite pieces with confidence and charm. A vintage sailor's blouse is covered by a classic jean jacket and then a masculine top coat finished with her usual touch of sparkling brooches. A jaunty black beret is also given the brooch treatment, finishing the look to perfection. It's obvious that she's come full circle, is happy, ready for a real career, and even a real love. 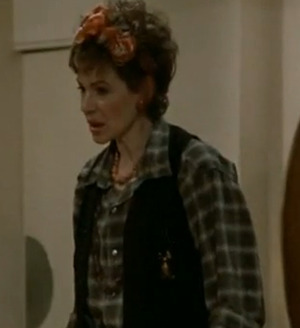 When Holly reads Mickey her script in the next scene, she's wearing a breezy oversized plaid shirt and a black menswear vest; a pairing which is back in style again today, 24 years later. Her scarf is tied in a bow in her hair, bringing a sweet touch of femininity. She seems to have grown younger through the course of the film, even as years have passed. As we say goodbye to Holly & Mickey (for another year), they're seen in a long shot in the park, where Holly has covered this outfit with a vintage fur coat, bringing a self-assured and glamorous finish to her quirky look. Every time I watch this film I want to go shop on Haight Street and find a vintage sailor's blouse and a few more brooches. 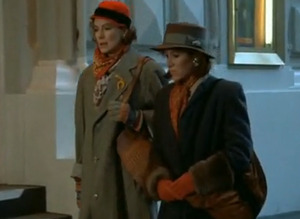 Or, at the very least I want to find some Grandpa's closet and raid it for funky old coats and hats. I think that Holly shows a great lesson of life: that you are what you wear, even if it takes you a long time to put together the right ensemble.